A video and tutorial for understanding Flow Metrics.Majestic Blog A video and tutorial for understanding Flow Metrics. Majestic SEO raised the bar after taking a look at page and domain metrics in the industry. Majestic now uses an iterative process – flowing through our web graph – to give you easy-to-understand numbers on how effective a URL is based on the flow of a characteristic through the web. Our tutorial video (above) on Flow Metrics takes you through two metrics from Majestic SEO – Trust Flow and Citation Flow. These form the initial pillars of our flow metrics algorithm and can be applied to any URL, sub-domain or root domain. To help visualise how Flow Metrics work, let’s imagine a wave coming up onto a shore full of rock pools, and you want to be able to predict which rock pools are likely to have water in them. The wave comes crashing over the rocks, and we know the pools closest to the shore will fill up. When they do, they spill out into neighbouring rock pools, and so on and so on. The water will continue to flow through several pools to fill up a rock pool a long way from the shore line, but eventually, that flow will dry up. Search engines measure trust in a similar way, and understand that trustworthy sites tend to link to other trustworthy sites. The weight of that trust can be passed through several pages, until, like the water, the flow runs dry. Majestic SEO’s new flow metrics seek to capture that same flow of trust across the web. To accurately measure this, there are a huge number of iterative algorithm calculations going on behind the scenes during each index update, measuring each page’s Citation and Trust Flow, and proportionally recording the value of that trust flowing through each page, mapping these digital rock pools at lightning pace. Doing this one is cool. Repeating that millions of times is incredibly difficult – but we have cracked it, thus this data is now available to Majestic SEO users in all of your reporting tools. We’ve built these new Flow Metrics into our Site Explorer, Bulk Backlink Checker Tool and our reports; so like all of our products you can drill right down to the detail. 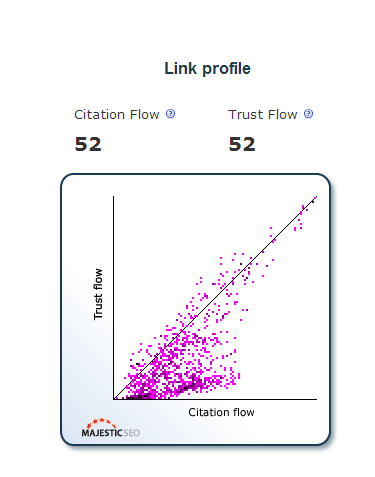 Every link to a site has a Trust Flow and a Citation Flow value between zero and 100. So every link fits on a 100×100 grid. Dropping in a URL into Site Explorer, here we see a small version of the Link Profile graph, with more detail found in the Link Profile tab above. In this tab we also have the option to switch the graph between Referring Domains, and External Backlinks. Links with high Citation Flow end up further to the right. Links with more Trust Flow end up closer to the top of the chart. Of course, many links could have the same scoring, so the density and colour of the chart helps to visualise these, with darker shades representing a larger number of URLs with the same Trust and Citation flow values. The Top Backlinks and Referring Domains tabs have also been updated to provide the precise Citation and Trust Flow metrics for each link or domain linking to the site you are analysing. Let’s compare two sites with quite respectable link profiles – SearchEngineWatch and SearchEngineLand. Due to the nature of links across the web, almost every link flow chart that you generate for a domain will tend to have a similar elliptical shape; however, like fingerprints, for every site, no two charts will be exactly the same. Now let’s compare a respected site like the BBC with a less dominant site like XL Pharmacy. The lower quality site not only has LESS links, but the areas where the colour is darkest seems to be much lower on the TRUST axis and much closer to the origin. Ultimately, these graphs aim to provide the user with a quick visual representation of Trust and Citation Flow, whilst allowing the user to access the finer details through using the rest of the toolset available. So let’s take a look at the metrics in detail. These two metrics have intrinsic differences, which is why the charts are not symmetrical. The Citation Flow predicts how influential a URL might be based on the number of sites that link to it. So rather than just counting the number of pages linking to a site or URL, we measure the flow back through a number of websites, recording the changing levels of flow to give a much more definitive score. As links are not measured with equal weight – and because a strong link will have a relatively stronger influence on URLs further down the chain, you can see how much better Citation Flow is as a mathematical logic, than the old metric of AC Rank. Trust Flow on the other hand began with a huge list of manually reviewed URLs across the web. These all have a crowd sourced level of trust – but by no means include all the trusted sites on the web. It turns out however, that trustworthy sites tend to link to other trustworthy sites. Those too tend to link to other trusted web pages and so on. Trust Flow measures that level of trust passing through pages across the web, and like the Citation flow, provides a simple zero-100 score for the user. The power behind the Flow Metrics doesn’t stop at Top level URLs. Whilst the charts do not report on internal links, the flow metrics DO pass through them. This means a strong homepage can influence the metrics of pages within its own site, whilst strong external links to inner pages will significantly boost the flow metric score overall. At Majestic SEO, we crawl the whole web. With more than a billion unique URLs in our Fresh Index alone which is refreshed around three times a day, we’re the largest, fastest link map on the planet, and every time our index updates, so do the Flow Metrics. How do Citation Flow and Trust Flow differ from Page Rank and Domain Rank? Obviously, sites with a high Citation/Trust Flow would have a high Page/Domain Rank, but I’m wondering how or when to use one over the other. 2: Our scores are much fresher as they update every time the index updates, whilst PageRank only updates a few times every year. 3: You can get our scores at scale much more easily than you can with PageRank using out bulk backlink checker. That explanation was a revelation. I have to admit I read your glossary a few times but never seemed to get my head around it. It might be worth putting some of this post into it? Thanks for diving deep in to this. Pretty much clears the doubt about your metrics. I will be waiting for more blogpost from ya on using these metrics wisely or further giving details about the same. – is meant to indicate 0 value, we’ll change it to be displayed as such soon. Can you tell me what factors come in to play when trust flow drops? Could a high OBL on a domain lower trust flow? I would be interested in knowing all the factors that may be affecting my domains trust flow? In short: Internal link structure can affect Flow metrics – so if every page on the site pointed to your “about us” page, then this would mean more link juice would flow towards that page. If you have huge amounts of OBLs I think that would dilute the internal link equity. However – you could lose Trust or Citation flow without anything changing on your site AND without any link to your site changing! This is because one or more of the sites linking TO you has a change in their Flow Metric fortunes, which knocks on to you. So… as the web readjusts post – penguin – our metrics will be adjusting to show the new landscape. That seems unusual. We do not provide consulting advice, but it would suggest that either some very strong links to you site have gone or – perhaps some site-wide links. Have a look at the lost links chart to see what happened. Remember that Flow Metrics are also affected by your internal link architecture – so a change on your menu structure might have an impact.